Asia is the self-titled debut studio album by British rock band Asia, released in 1982. It was Billboard '​s #1 Album Of Year for 1982. The album contains their biggest hit and signature song, "Heat of the Moment", which reached #4 in the US on the Billboard Hot 100 chart. Upon its release in March 1982, Asia enjoyed massive commercial success, reaching #1 in the US and spending nine weeks at the top of the Billboard album chart. According to both Billboard and Cash Box, it was the #1 album in the United States for the year 1982. Asia was certified 4x-platinum in the US by the RIAA on 10 February 1995. Robert Christgau panned the album and gave it a rating of "C–". In his Consumer Guide Review the critic stated that "rare that a big new group is bad enough to sink your teeth into any more" and called Asia "pompous – schlock in the grand manner". On the other side, Tom Demalon of Allmusic, in a four-and-a-half-star review, praised the album saying that "there's no denying the epic grandeur of the music, which provided some much-needed muscle to radio at the time, and did so with style". 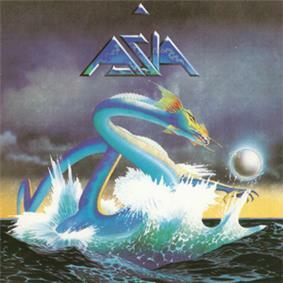 Asia's logo and cover artwork were created by Roger Dean, known for his work with Yes (of which guitarist Steve Howe and keyboard player Geoff Downes had previously been members) and Uriah Heep which depicts a leviathan gazing into a crystal orb. All songs written and composed by John Wetton and Geoff Downes except when noted. ^ a b Demalon, Tom. review"Asia". ^ a b Christgau, Robert. "Asia consumer guide reviews". www.robertchristgau.com. ^ a b c d e "Asia chart positions in the US". ^ 200 – Year-end albums – 1982"Billboard"The . Billboard. ^ a b c "RIAA's Gold & Platinum Program searchable database". ^ a b c d "Asia chart positions in the UK". ^ a b c "BPI's certified awards search". ^ a b "Asia::Asia". Audio Fidelity.